Commissioned by King Frederick William II of Prussia as a sign of peace, the Brandenburg Gate has been one of Berlin's most important monuments for over 200 years – both as an architectural landmark and historic symbol. The grandest of a series of 18 gates circling the city, the Brandenburg Gate was constructed between 1788–1791 from the Propylaea-inspired designs of architect Carl Gotthard Langhans. This sandstone gate consists of twelve Doric columns that combine to form five passageways, topped by the imposing Johann Gottfried Schadow statue, Quadriga – a four-horse chariot ridden by Victoria, the Roman Goddess of victory. This LEGO® Landmark series interpretation of the Brandenburg Gate was designed by US architect Adam Reed Tucker in collaboration with the LEGO design team. This comes down to 19.27 cent per brick. 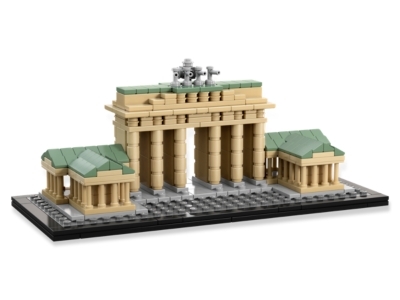 The Brandenburg Gate (21011) Lego set is no longer directly available from the sites below. However, 3rd party partners of these sites might still have the set available. Alternate description Create an historical monument with this real-world architectural replica of the Berlin’s famous Brandenburg Gate.